Home » Category archives "Veggies"
The shorter days and grey skies really have me yearning for comfort foods. And this recipe definitely fits the bill. 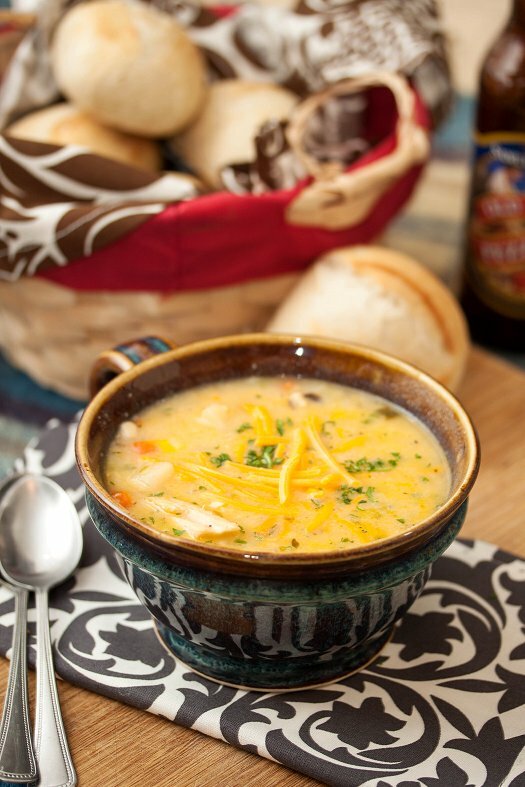 A deliciously cheesy chicken chowder that can be made in just a few minutes. I usually use leftover chicken. However there’s no shame in the store-bought rotisserie game. Just stay away from the canned stuff, ick! A quick saute of stand-by veggies – all the usual suspects: onions, carrots, celery, garlic. Then some carbalicious goodness in the form of potatoes and corn join the party. With a good helping of shredded cheddar and heavy cream, ya know… to throw the richness factor just right over the edge. Pair with a nice green salad, and some warm crusty bread. Sheer perfection! As with any soup, stew, or chowder – this just gets better after a day in the fridge. Perfect to whip a batch up and enjoy for lunch all week. Add 2 Tbsp olive oil to a dutch oven or large saucepan. Add onions, celery and carrots. Saute for a couple of minutes until starting to soften. Add minced garlic, and saute for another minute until fragrant. Add the flour to the vegetables and cook for another minute or two. Carefully add the chicken broth, corn, and potatoes. Cover and simmer for 12-15 minutes or until vegetables are tender. Reduce heat. Add chicken, heavy cream, and cheddar cheese – stirring until melted. Cook for an additional 5 minutes to warm through. Serve immediately with some additional shredded cheese and a sprinkle of parsley. I’d mentioned earlier this summer that I was helping out with the Chincoteague Bay Field Station’s Serving Up The Shore event this year. 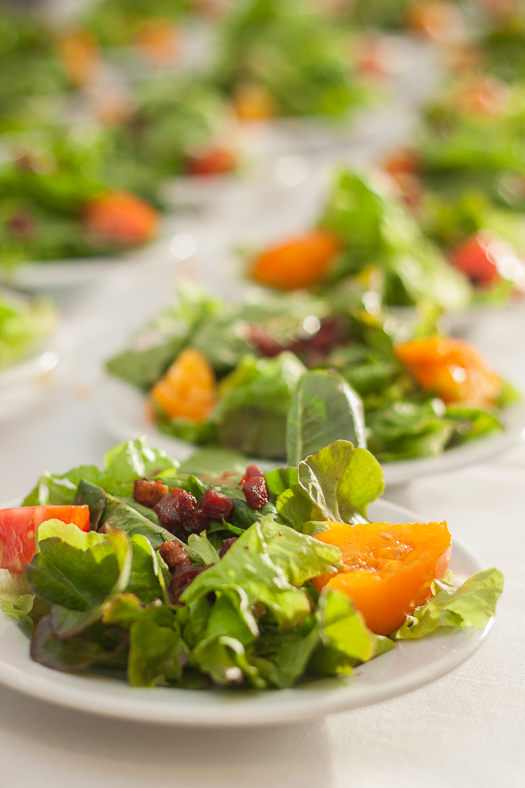 I created the salad course, which was a simple green salad topped with big hunks of heirloom tomatoes and crispy ham – with, get this…a red-eye vinaigrette. It was pretty amazing, and well received! For me, the coolest part was getting to know so many of our local farmers and producers. The folks that are out there, fighting the good fight for sustainable and ethical farming and production procedures – right in my own backyard! 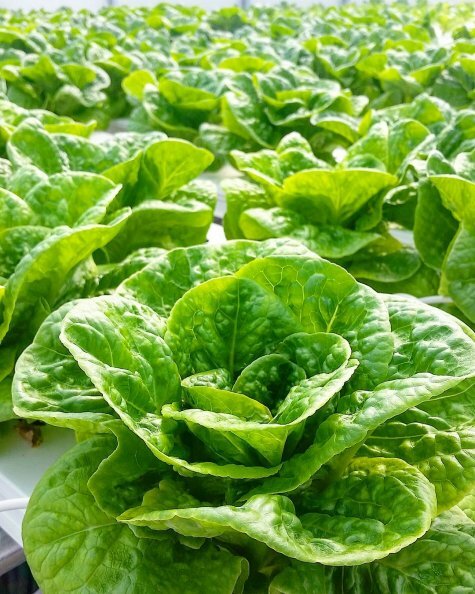 Big shout out to Johnny at Terrapin Farms, who donated the gorgeous hydroponically grown greens. They’ve got an awesome operation at their farm in Berlin, MD. Was such a treat to visit and see everything in action! 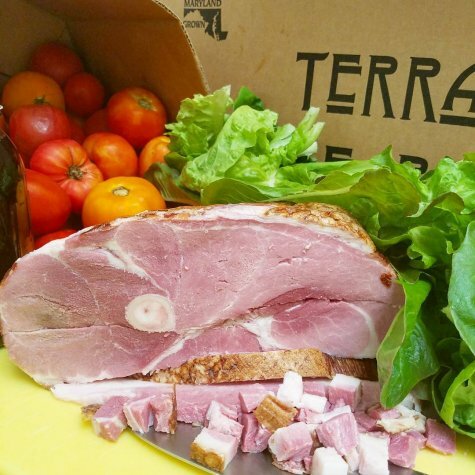 Natalie & Stewart at Perennial Roots Farm, for the absolutely perfect ham for the job (I’m sold on Mulefoot, ya’ll) and the epitome of summer in the form of those tomatoes. They’re a wonderful couple who are so passionate about sustainable and biodynamic agriculture, just a wealth of knowledge! We are so fortunate to have them here on the Shore. Be sure to follow them on Instagram too. Their feed is full of wonderful goodness from the farm, that makes me smile on a daily basis. Kristen & Jamie at Eastern Shore Coastal Roasting Company. You guys seriously rock my world. The Fogcutter was just perfect for the vinaigrette. Loved having that bold coffee flavor shine through! 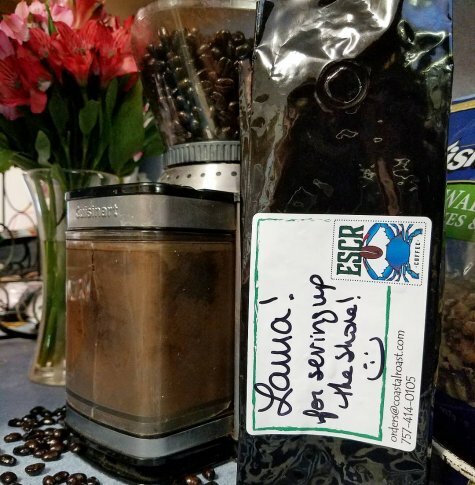 Guys, their coffee is ahhhmazing…and, now available for purchase online. Go buy some! 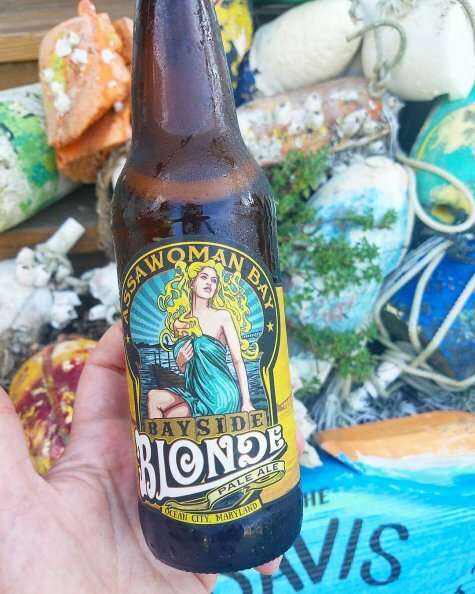 The good people at Assawoman Bay Brewing Company, for keeping us in good beer all evening long. Keep on doing what you’re doing guys, looking forward to visiting the brewpub this fall. And finally, to everyone who came out! It was such fun, and I’m already looking forward to seeing what next year will bring. I wanted to incorporate as much local flare as I possibly could in my dish. Red-eye gravy is something that’s more common in the deep south, but it’s always been a favorite for me. It’s usually served in the form of a ham steak, that’s been browned in a skillet. Then, the pan deglazed with coffee. Served for breakfast, lunch, or dinner – it’s a classic that’s stood the test of time. I kept this same theme, but diced up the ham so it got super crispy. Think – meat croutons! Deglazed the pan with the coffee, then added in traditional things you’d find in salad dressing…red wine vinegar, dijon, olive oil. Paired with the simple fresh greens and big hunks of heirloom tomatoes, it translated so perfectly to a summer salad. But, I’m fixin’ to use the same dressing over a roasted vegetable salad this fall. The flavors would definitely mingle very well there, too. Will report back! Add 1 Tbsp of olive oil to a large skillet over medium-high heat. Add the diced ham, and cook until well browned and crispy. Making sure to stir every now and again, for about 15 minutes. Using a slotted spoon, remove ham to a paper towel lined plate to drain – reserving any drippings that have rendered. Carefully add the coffee to the skillet, using a wooden spoon to scrape up anything sticking to the botoom of the pan. Increase heat to high and reduce the coffee by about half, about 3 minutes. Turn off heat and whisk in the vinegar, mustard, 2 tsp kosher salt, and a few grinds black pepper. Carefully pour this mixture into a mason jar, and add the olive oil. Screw the lid on, and shake until well combined. Season to taste with salt and pepper. Serve over bed of mixed greens with the chunks of tomato. Drizzle with the vinaigrette. Top with the crispy ham bits. This summer was insanely hectic. I feel like it passed it a blur of beaching, boating, and warm summer nights. I wasn’t in the kitchen making new things to share with you as much as I’d like, but now that the days are becoming cooler – it’s my favorite time of year to be in the kitchen. Not to mention it’s the best time of year to work with the bounty that your garden, or local farmers in your area have produced. I’ve always been passionate about gardening, and particularly varietal history and seed saving. So when the good folks at Thomas Jefferson’s Monticello reached out and asked me to share the details on their 10th Annual Heritage Harvest Festival happening this weekend, I was delighted to do so! Thomas Jefferson championed vegetable cuisine, plant experimentation, and sustainable agriculture. In today’s modern world, they are continuing that tradition at Monticello – and have been doing so, for many years. They were kind enough to send me a beautiful box of garden goodness fresh from the fields. I mean – what an honor. Talk about tasting history! 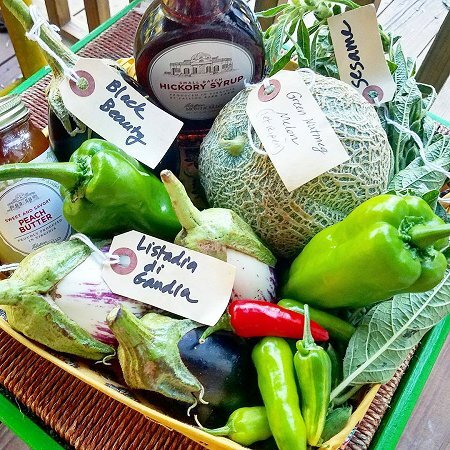 Eggplants (Listadia di Gandia and Black Beauty), Peppers (Marconi and Fish Hots – a variety that was used in seafood houses in my region for hundreds of years), a Green Nutmeg Melon, fresh sesame, and some of their locally made Hickory Syrup and Peach Butter available from their online shop. I can’t thank them enough for sending that box of loveliness my way, it was a real treat! I ended up tossing the eggplants Marconi peppers with a little olive oil and salt, and added a tomato and some garlic from my dad’s garden for good measure – then roasted. That’s a great way to get out excess moisture, that can lead to soggy situations in whatever dish you’re preparing. Plus, it really intensifies all of the flavor. Used my favorite pie crust recipe to line my tart pan, and blind bake. Then piled in the roasted vegetable goodness and a rich egg-custard to fill in all the nooks & crannies. And a little goat cheese for good measure. A local farmer has been selling his goat cheese at the farmer’s market here on Chincoteague, and it’s insanely wonderful. Have been enjoying it every chance I can get! A quick bake for about half an hour, and you’re good to go. Paired with a simple green salad, it’s the perfect meal for this time of year. Could also be made in a pie plate without the crust! And, if you’re in the vicinity and looking for something to do tomorrow – make sure you check out the Heritage Harvest Festival at Monticello. The’ve got a great lineup of speakers, activities for kids, gardening info, seed saving, good eats….they’ll have it all! A great day to get outside and live, breathe, and taste history. Preheat oven to 425. Place eggplant, pepper, tomato and garlic on a baking sheet. Drizzle and toss with 1 Tbsp olive oil and a pinch of salt. Place in oven and roast for about 25 minutes. Until vegetables are soft. Let cool slightly and remove the skin from the peppers and tomatoes, and eggplant as well if you desire. Roughly chop, and set aside to cool. Reduce oven temperature to 375. Line a 9-inch tart pan or pie plate with your crust. Press into the bottom well, making sure to get in the base. Trim the top of the tart pan with a rolling pin, or crimp the edge if you’re using a pie plate. Line with parchment paper and place pie weights or beans inside. Place in the oven to “blind-bake” for 20 minutes. Remove from oven, and remove parchment with weights. Place crust on a baking sheet. Scatter the roasted vegetables evenly on the bottom of the crust. In a bowl beat the eggs, egg yolk, half & half, salt and pepper until combined. Pour mixture into the shell. 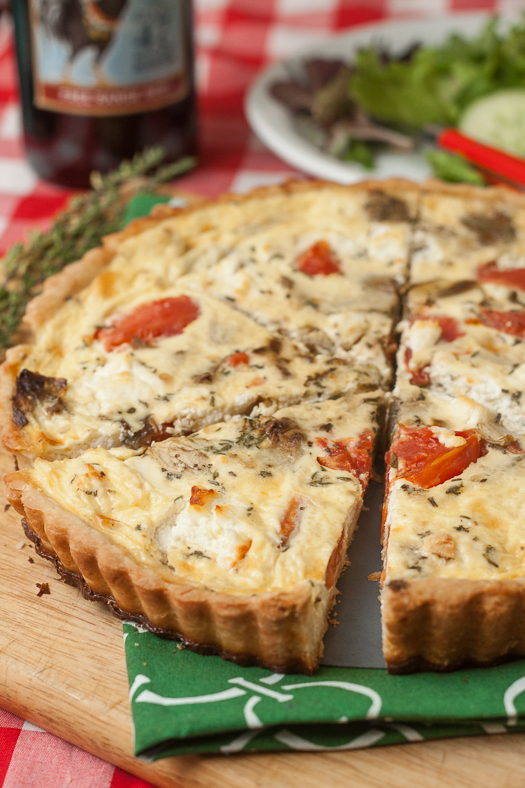 Break the goat cheese into pieces and scatter that evenly on top of the quiche. Carefully place in oven and bake for 30-35 minutes, until center is done by still slightly jiggly. Let cool for a few minutes before slicing and serving. Have you guys hopped on board the spiralizer bandwagon yet? I hadn’t, but have wanted to for quite some time. 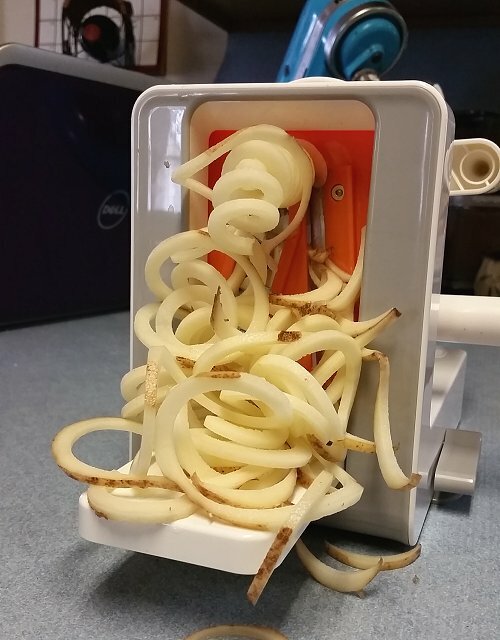 So when OXO reached out to me to give their new Countertop Spiralizer model a try, I was happy to oblige. I opted for the the standard zucchini noodle to get my “feet wet”, and then quickly found myself spiralizing everything I could get my hands on. It’s so much fun to use! Couldn’t be any easier to clean or store, and has three different blades for a plethora of slicing needs. Like curly fries! I’m trying to think on the healthy side – but it’s hard to deny the fact that for me this is groundbreaking. Curly fries. Sprinkled with Old Bay. From the comfort of my own home. Ya heard? Of all the things I passed through this little gadget last week, I think I had the most fun with broccoli stems. 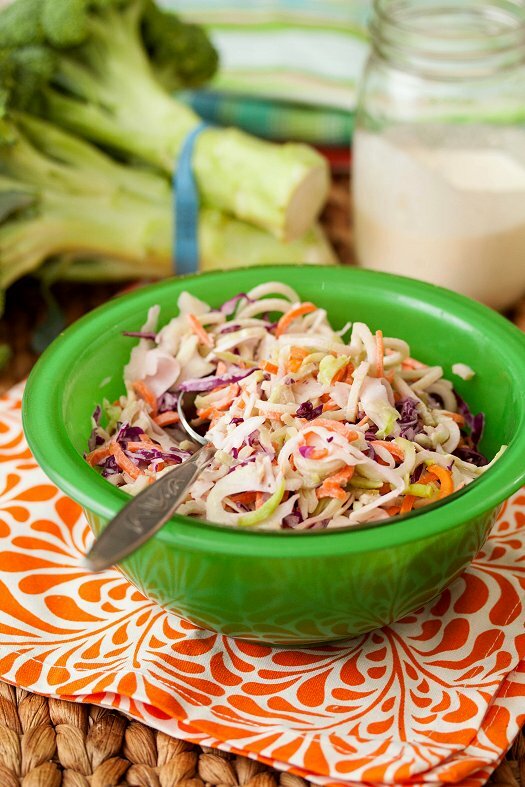 I always felt so bad tossing them in the trash on the regular, so believe me when I say it felt so good to make this delicious, crunchy, and tangy slaw with those big green stalks! What a great way to stretch a buck, and good for you to boot! I mixed with some shredded green and red cabbage, as well as some shredded carrot for a little additional crunch and pop of color. Would be the perfect addition to any potluck party table. In a large bowl, whisk together mayonnaise, greek yogurt, vinegar, honey, and celery seed. Add in broccoli, shredded cabbage, carrots, salt and pepper. Toss to combine, and season to taste. Cover and refrigerate for and hour to let flavors meld before serving. Disclaimer: This post is sponsored by the good folks at OXO. As always, all thoughts and opinions are my own.